Indian opposition MPs have protested in parliament against Hindu nationalist groups for converting religious minorities to Hinduism. They accused Prime Minister Narendra Modi of doing little to stop his hardline supporters from forcibly converting Muslims and Christians. The protesters forced the upper house of parliament to adjourn after shouting matches led to chaos. Conversions are legal if they do not involve force, fraud or inducement. But in recent weeks, a number of religious ceremonies have been organised in different parts of India by Hindu hardline groups, close to Mr Modi's governing Bharatiya Janata Party (BJP), and there have been allegations that they involved force, fraud or inducement. The Hindu groups have denied the charges, saying the conversions have been voluntary. Earlier this month, more than 50 Muslim families were reportedly converted to Hinduism against their will in the town of Agra. At the weekend, it was reported that about 100 Christians had converted to Hinduism in the western state of Gujarat while 30 Christians were converted in the southern state of Kerala. Hardline Hindu groups like the RSS (Rashtriya Swayamsevak Sangh), Bajrang Dal, VHP (Vishwa Hindu Parishad) and others say that Indian Muslims and Christians were all Hindus who have converted to other faiths over the last few centuries. These groups regularly hold ceremonies which they call "ghar vapasi" - or returning home - to allow Christians and Muslims to return to their "original religion". 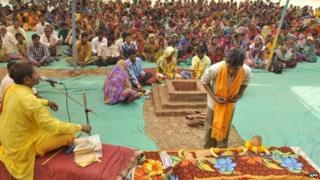 At the weekend, the head of India's most powerful Hindu group, the RSS, vowed to continue with the conversions. "We will bring back those who have lost their way. They did not go on their own... They were lured into leaving," he said. Mr Modi's ministerial colleagues have said that the government does not support forced conversions, but the opposition MPs have now protested for days in parliament, demanding a statement from the prime minister. Critics say Hindu hardline groups are flexing their muscles under Mr Modi and undermining India's unity and secular nature. Recently, a row broke out after government minister Niranjan Jyoti used an abusive term to refer to non-Hindus, by asking people at a public rally to choose between Ramzada (children of the Hindu God Ram) and Haramzada (bastards). Mr Modi said he disapproved of her language but refused to sack her. Another BJP MP apologised in parliament after praising the killer of independence leader Mahatma Gandhi as a "patriot".